LAS VEGAS, April 3, 2019 /CNW/ - Planet 13 Holdings Inc. (CSE: PLTH) (OTCQB: PLNHF) ("Planet 13" or the "Company"), a leading vertically-integrated Nevada cannabis company, announced today that it has launched its third wholly-owned brand, Leaf & Vine, following the significant success of its Medizin line of connoisseur focused products and the TRENDI line of compact, easy-to-use disposable vape and concentrate products. Leaf & Vine products will be available on Superstore shelves today April 3, 2019. "We have designed Leaf & Vine specifically for a more casual social experience. Using a hand-selected variety of strains with a higher CBD content, Leaf and Vine is perfect for a fun night out or to spice up a conversation over dinner," said Larry Scheffler, Co-CEO of Planet 13. "Planet 13 has a proven model for designing, launching and selling branded products. The TRENDI brand we launched in November is now the number one selling concentrate brand in Nevada1. With a customer-focused approach to product development, a commitment to ultra-premium quality and the world's best showroom floor for new and innovative products, Planet 13 possesses a brand development and sales platform that is irreplicable in the cannabis industry today." Leaf & Vine specializes in premium cannabis concentrates and elegant vapes with touches of classy chic elements. 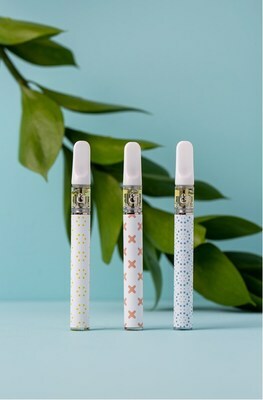 Created with handpicked strains with higher CBD content and high-quality vaporizing technology, Leaf & Vine is the perfect brand for on-the-go, sophisticated lifestyles.